Discography research is an arcane enough hobby. But Brian Rust, despite his profile in that community, managed achieved a level of willful obscurity all his own. He self-published a 'zine (to use the modern parlance) somewhat regularly starting in 1985 which included editorials, sales, and discographies. But the magazine was a bit hard to find. Tim Brooks at the ARSC [SOURCE] had this to say. 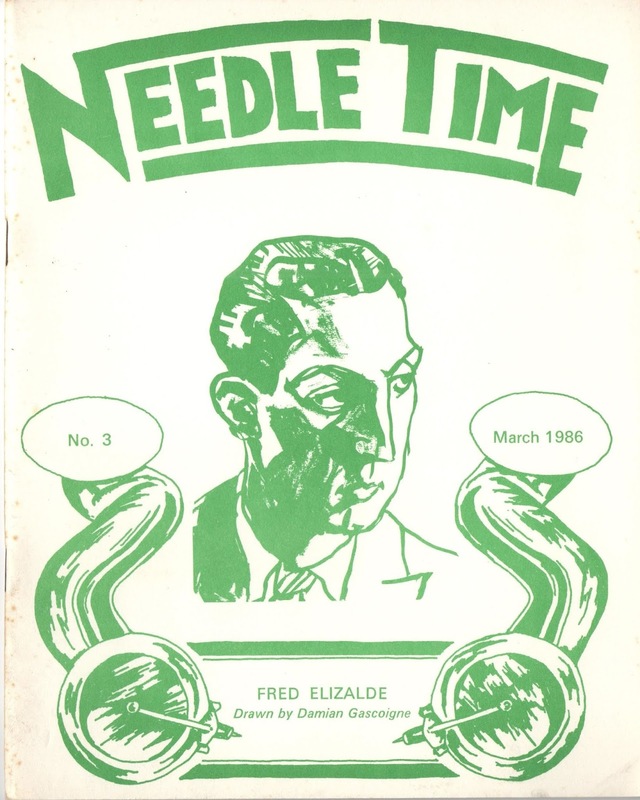 "Needle Time, incidentally, is one of those "secret" publications that you may hear about in passing once in a while, but seem to be deliberately hard to find. Despite the fact that it is edited by one of the best known names in discography, to my knowledge it has never advertised in the United States, has not been reviewed here, and is found in hardly any libraries. Even a direct request to Rust himself for information, a couple of years back, brought no response!" 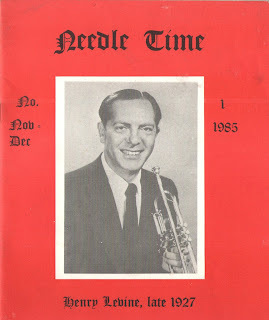 Needle Time was published bimonthly-ish by Mr. Rust, to the benefit of we bookish discographers, writers and collectors of vintage jazz. 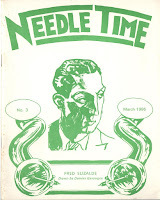 The average issue of Needle Time was perhaps 32 black & white 6.5" x 8.25" pages, but it wasn't cheap. The cost was a rather steep at the time. 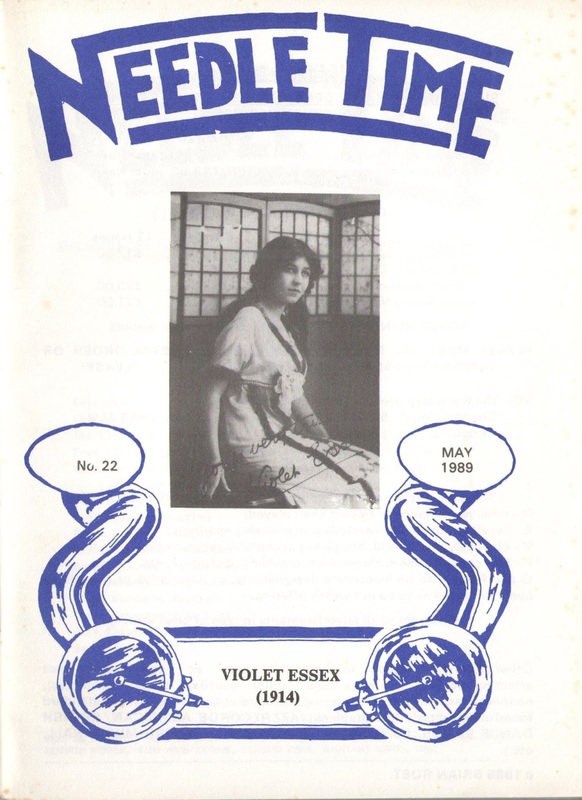 In 1985 it started out at 5.00£ for a 1 year subscription (UK) or 8.10£ (US). But that had jumped by 1989 to 10.30£ per year for 6 issues overseas or 20£ for two years (12 issues). But Rust didn't take personal checks! So a subscriber had to mail physical cash or pounds sterling to his address in Dorset, England. The dimensions of the magazine shrank sometime between issues 4 and 12 to about 6" x 8.25." While the format was a bit handier, it may have been perceived as "shrinkage." But issues got longer. The first issue is only 23 pages long, issue 22 is 40 pages long. Though they always had varied, Rust was definitely putting out bigger issues over time. In Americana terms Rust was like Joe Bussard, but more prolific. The Guardian Newspaper called him leading the jazz discographer of his generation. More here and here. Rust also hosted a weekly radio program on Capital Radio in London from 1973 to 1984 called Mardi Gras. It was an hour long Sunday program that aired at 10:00 PM. (There are several episodes up on YouTube.) (Bruce Epperson puts the start of the long-running Sunday night program in 1971.) But his debut in radio was probably in 1957 playing washboard with the Barnstormers Spasm Band. Reputedly Rust left the group in 1958 after the BBC, citing conflict of interest (with his Sunday program) refused him permission to appear on TV. The program opened and closed (at least in the 80s) with The Charles Dornbeger Orchestra version of "Tiger Rag." Brian would say "You are listening to Capital Radio. Thsi is Brian Rust welcoming you to another Mardi Gras, a carnival of the best in vintage popular music and all that jazz..."
Sounds Vintage Magazine [LINK] reported on the end of the program writing "...The Carnival is over. Yes, Mardi Gras is being given the chop to make way for "restructuring"of Sundays on Capital, including a high fallutin' magazine program so beloved of producers and planners..." Vintage Magazine went on to write that they had been enlightened and entertained by the best program for jazz heads. So Needle Time perhaps became the hobby that Rust took up after radio. But for Rust discography had always come first. His first publication as a discographer came in 1943 in Jazz Tempo Magazine in a 6-part series on the obscure group Goofus Five. By 1948 he was writing regularly for Gramophone. Rust appears in the book More Important Than the Music by Bruce Epperson dozens of times as the man and dozens more times as a source in the footnotes and bibliography. In it, Rust is described in the book as having taken a boring job at the Bank of England only so he could afford his real passion - vintage jazz and dance music. He later worked at the BBC gramophone library until 1960. He wrote or co-wrote 15 book-length jazz discographies, and 31 issues of his magazine Needle Time. Needle Time was named for the BBC rule limiting the amount of recorded music that could be broadcast in a day. (I'll write about that another time.) Brian Rust died at the age of 88 in the year 2011. Below is my partial Needle Time bibliography from my personal collection.